Yesterday I ran into some Chinese bikers who were also heading for Tibet. They'd originally made contact with each other via a mountain bike website and traveled from various parts of China to join this group expedition to Lhasa. They'd only been riding for two days from Lijiang, just 100kms away, and one of them had just joined that morning (having been delayed) and set out on his first day unfit and unacclimated to pedal 100kms and climb 1400 metres to an altitude of 3250 metres! I realize being professionals with only a few weeks off from work they had a tight schedule, but this seemed too much too soon. I hung around the group for a while mainly for something different, and to trade conversation with a couple of them that spoke English. It wasn't too long however before the new recruit started lagging behind and swaying all over the road, complaining of heart pain. All the others were already out of sight up the mountain by this point, and his radio didn't seem to work properly, or was already out of range, so we stopped and thankfully he spoke enough English to be persuaded to wait for a bus. Traveling to Tibet is a relatively new concept for Chinese people who have only recently begun exploring their own country and neighbouring areas since the easing up of things here both politically and economically. The opening of the new railway from Beijing to Lhasa has brought a deluge of publicity in the form of TV programs and magazine articles that is designed in part to attract Han Chinese business investors and tourists alike to what the government has dubbed 'Shangri-la'. For centuries Tibet has been a place of mystery with an almost mythical appeal for many people, including the Chinese. But this is fast changing: the mist is now fast lifting and if you have around 300 Yuen (around $40 USD) for a train ticket, or a mountain bike as these folks have, then paradise and the forbidden city beckons. As long as you're Chinese though. If you're a 'foreigner' you need around five different permits, issued by five different authorities (army, PSB, police etc) and be a part of an established tour group in a 4WD jeep in order to travel overland through eastern Tibet. Which is one reason why I won't be joining as the 10th member of their group. Another is the limitation of traveling in such a large group speaking another language would drive me mental after a while. Much of the past few days layover in Kunming and today back in Dali have been spent poring over maps of the next section up into Tibet to Lhasa. It will be the most demanding part of this leg from Singapore to Mumbai, with over 1600kms of very rough terrain, often between 4,000 and 5,000 metres altitude, along a road that frequently dissolves into a muddy track for hundreds of kilometres at a time. It's the section that has been monopolizing my thoughts for over a year now. I reckon there's a 50/50 chance of making it to Lhasa on a first time attempt (for various reasons). And if I can make it to Lhasa, Mumbai is just around the corner. The chances of success will to a large degree depend upon decent maps, and that's where it starts to get really interesting! I have reports from a handful of cyclists who have biked this section before and thoughtfully published their experiences - written in English - on the internet. But the best maps are actually Russian topographical ones. I was able to find an oversize printing outfit in Kunming to print out hard copies of digital files that my father kindly sent me (no questions asked on copyright - it's China!). Great, so I have detail of the terrain. But the cyrillic names of the towns and key physical features won't mean a thing in the field where all the signs will be in Chinese Mandarin and the local people will only know them in Chinese and...Tibetan? So we're going from Russian, to Chinese/Tibetan, to English. While I've been lucky enough to find English speaking Chinese to help translate from the Mandarin alphabet to English, the Russian to Mandarin has all been using latitude/longitude. 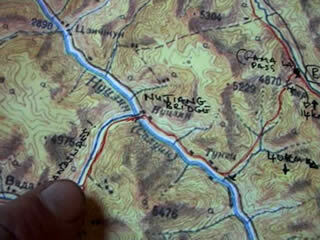 But then the small scale 1:250,000 Chinese maps I'm using don't have lat/long. But a 1:1,000,000 version does, so there's another hurdle to jump through to transpose between these two maps. I'm actually in the provincial capital of Kunming at the moment, having backtracked to get the rear wheel of the bike fixed and a bunch of other things that can't be done in Dali. This is the last major pit stop before....India? Lhasa is the next big city, 2000 kms from here over some very rough roads/tracks and several 5,000+ metre mountain passes. I even have tea bags on the list of things to get. Not sure how long the novelty for yak butter tea will last. Kunming fits the 'new' image of China that everyone's been banging on about; the economic growth explosion associated with the country joining the world stage as an emerging mass consumer culture. Walking around downtown Kunming one might as well be in Singapore, or any American or European city. Most of the shops have catchy, trendy English names (yet very few of the staff inside will speak any English) and sell everything from the latest authentic Paris fashions to double mocha flavoured frappuccinos. And it's all presented with a designers flare for colour, slick lighting and the right dance music to lure the customers in. Which gets me thinking, what has been the first two weeks since crossing the border been all about? The wretched roads ankle deep in mud. The backward attitude of some the locals in the small towns towards outsiders and the frightening hygiene standards in the local hospitals? It's hard to reconcile the two. There is clearly an enormous disparity developing between the haves and have nots in China, with one developing so quickly there seems little chance of the other ever catching up. I know nothing about the economic development of countries, but I can't help feeling there are big problems down the road for China if the lessening of this gap isn't a somehow a part of the longterm plan. Like an idiot I broke the golden rule of traveling and didn't being a camera with me, so I'm afraid I don't have a vlog to show you of Kunming. I do however have a sequence shot on the last day before arriving into Dali of the road in total chaos with vehicles, water buffalo, cyclists, pedestrians, dogs and kids on homemade skateboards melded together in one giant muddle. Actually its rather poignant. 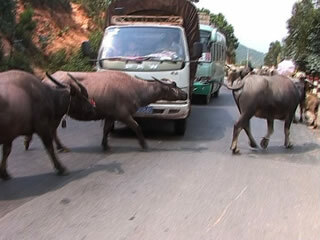 The image of a herd of water buffalo calmly meandering down the spotless mainstreet of Kunming bringing traffic to a standstill might remind people of how very different life is just a few miles away in the country. It's harvest time in Yunnan Province and the rice is ready for reaping! For the past few days I've been biking up a beautiful river valley that looked on the map like it might save some miles to Dali (rather than going via Kunming) and go with the terrain rather than over it. So far the map has proved accurate in this regard, and there's been little traffic to boot. A temporary lift to the daily deluge of rain is allowing farmers a weather window to begin the rice harvest, which dominates valley life and seems to have everyone in high spirits. 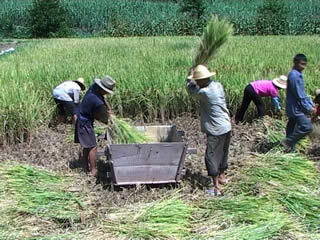 As you'll see in the video it's a completely non-mechanised affair: the women first use short 12 inch sickles to cut the rice plants 5-6 inches above the ground which the men then thresh over a wooden collecting box. The rice seeds are finally transferred to sacks and ingeniously secured using a rice stem for rope. And although all done by hand, the party moves through each rice field with surprising speed. Once a field has been harvested, the real work begins to prepare it for the next crop: the spent rice stems are gathered into stooks and propped upright to dry. Some of these are stored in nearby barns (for roofing houses perhaps?). The excess is burnt in the fields and ploughed back in along with the old plants. Most of the ploughing is also done without using machinery - just one man, a water-buffalo and a single metal plough blade attached to a yoke cut from a specially shaped tree branch. All pretty impressive stuff. It makes me wonder if the arable harvest in pre-industrial revolution England 100 odd years ago wasn't that dissimilar in method and tools. The family that I filmed certainly seemed to be having more fun than I can ever remember driving a tractor up and down for hours and hours putting up hay the modern, efficient way. Despite the bad roads and sickness, one high point of the route north from Jinghong has been biking on the old road through Xishuangbanna National Park. The initial disappointment of not being able to ride on the new toll road quickly turned to relief at not having to wrestle with the heavy trucks and the inevitable mud and grime they leave in their wake. The old road added miles onto the journey, but the pay-off was an 'old route 66' feel, where time seemed to lose immediacy and the sights and sounds of the surrounding rainforest stole our attention instead. Oh, and did I mention elephants? 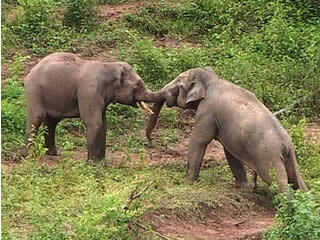 Rounding a corner we stumbled upon 11 of the remaining 300-odd 'wild' elephants that still inhabit the region. Now protected, they are perhaps the only locally threatened species on the increase (unlike wild tigers, leopards and golden-haired monkeys). The government now offers compensation to farmers whose crops have been destroyed by elephants and in 1998 they banned the hunting and processing of animals. Although still free-range I had the definite impression that these animals were used to the sight of humans, not surprising perhaps seeing as a major highway now runs straight through their backyard. Nonetheless it was great to see them. And the social interaction between the family members, in particular the capacity for play amongst the youngsters, struck me as almost human-like. Seems like we've been treading water ever since crossing the border into China. The rain, the awful roads and the bouts of fever and sickness have all conspired to slow the pace to an agonizing crawl. Yesterday, when we were just 60kms north of Jinghong heading north to Kunming, Melissa started complaining of nausea, headache and pain in her lower back. Her temperature then started climbing to over 40 degrees and after a temporary stopover in a rural clinic where she tested negative for malaria, we backtracked to Jinghong where we could be assured of at least some medical facilities at the regional hospital. Well, in hindsight that's a debatable point. It was obviously a cash-strapped hospital that created revenue by sticking everyone who walked, limped or crawled through it's doors on a saline drip, regardless of what was wrong with them. The place was filthy, with little or no hygiene standards to speak of. Doctors smoked openly in the corridors with patients. And the smell of the lavatories beside the temporary beds where Melissa was parked was at times overpowering. There were no basins in any of the Doctors offices or the wards for people to wash their hands with. Ditto the lavatories. And the sheets on the beds had clearly not been washed for 24 hours, if that. Luckily we had our own first kit with a thermometer with which to monitor Melissa's fever. The nurses had no interest in going anywhere near her unless harrassed to do so. It was one of those scary places that people left unattended to in a corner are liable to die and only be discovered days later after the smell gets too bad. The upshot of all this is that Melissa was diagnosed with several ailments: bacterial infection; urinary tract infection and a damaged lumbar region. Which one of these she actually had, apart from the obvious bad back, is anybody's guess. But there is little point in her continuing at this point into a region where there really will be no medical facilities at all (between here and Kunming), and with only a week left on her visa it makes sense for her to cut her loses and head for home while she's near an airport. So tomorrow she flies via Kunming back to Singapore where she can make her way to the nearest real hospital and get herself properly diagnosed and treated. Well, the fever broke after 24hrs as was hoped for with the high dosage of Malarone. This was the pretty much what happened after taking the same treatment for P. vivax earlier this year, only hopefully this time around there won't be any relapses. We gave it another day to try and regain strength and make sure the fever didn't return immediately, then saddled up and made a few tentative miles down the road towards the next town. At the very least we had to escape the horrors of the karaoke bar beneath where we were staying. I'm getting the definite impression that karaoke is HUGE in China, along with motorists driving MUCH TOO FAST, using their horns CONSTANTLY, and Chinese men walking around with their shirts rolled up to proudly display their POT BELLIES, and SMOKING like chimneys. It's a hectic, confused mass of human energy elbowing itself forward in life, with little subtlety or restraint. And if you stop for a second to look what's going on around you there's a good chance you'll get flattened by the stampede. On other note it sounds as if Melissa has serious visa problems. Her 15-day 'on entry' visa can't be renewed in China at all apparently. So unless she can wangle something tomorrow at the local PSB office here in Jinghong she'll most likely make it as far as Kunming and then have to fly out before the thing runs out in 8-days. Jason down with Fever - Malaria Again? After contracting Malaria (P. vivax) earlier this year following the Indonesian leg I had no interest in having a repeat performance on this leg through SE Asia, especially as we'd be traveling through some very remote regions with little access to medical facilities. So, with the advice of various of medical friends a formidable arsenal was put together for both field diagnosis and treatments that included both western and eastern medicines. I would take Doxycycline for prophylaxis, seeing as the route would take the expedition through the increasingly drug-restistant areas of Northern Laos and Southern China (i.e. where we are now! ), and if this didn't work 'then let the little blighters do their worst!' These were my thoughts as I trundled out of Singapore weighed down by what seemed (at the time) to be an excessively heavy first aid kit. Since reaching the malaria belt I've been super-careful to not get bitten, wearing long trousers and shirts in the evening as much as practically possible, and lathering 100% deet on all other exposed regions of flesh. It seems however that I have not been careful enough. My joints were feeling slightly achy during the two steep 13km climbs out of Mengla yesterday, but nothing too serious. Melissa then had to backtrack on a bus to retrieve her mobile phone left at the guesthouse in Mengla by mistake, so the rest of the day was a wash and we checked into a little guesthouse here in Mengyuan. By the time she arrived back at 5pm I was just starting a 3-stage fever cycle, with a 2 hour cold stage (during which I was wearing ALL my Himalaya cold weather gear under the duvet/comforter and still freezing), following by a hot stage and a third sweating stage, with a fluctuating temperature of between 38-39 degrees (controlled by ibuprofen), that's been the story for the last 20 hours. Although things have stabilized at the time of writing. We used a field test kit (thanks Alex from Austria for putting me on this!) 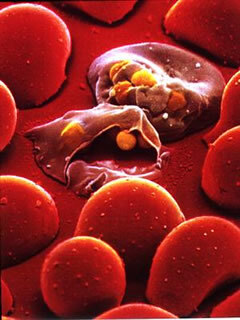 to test for Malaria. Even though kits like these are reported to contain a 15-20% error factor, when you're 16 hours drive along mountain roads from the nearest decent hospital, as we are now, they're certainly better than a poke in the eye with a sharp stick. 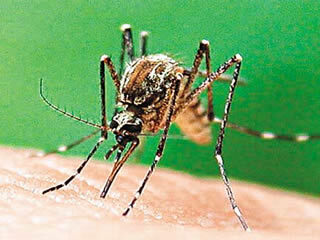 A fever in this part of the world means malaria unless proven otherwise. So if we could at least reduce or eliminate the likelihood of malaria, this might make decision-making easier as to what best to do. Even though we didn't get quite the full amount of blood recommended (Melissa is afraid of too much blood), a faint trace on the test cassette indicated the presence of P. falciparum. While the most dangerous of the four plasmodia in terms of leading to cerebral compications and over one million deaths each year worldwide, the good news is that we have the ammunition to deal with it! Currently I'm taking a concentrated course of Malarone combined with a herbal treatment called artemisinin used by Chinese practitoners since A.D. 341 where it has proved to be the best-ever anti-malarial drug (and I'm quoting an excerpt from an article in a medical journal my friend Dr Sharon Kessler in the US sent me!). However, it is not yet currently available in the west (no surprises there). For anyone interested you may be able to order it from this website (keyword 'malaria' for Artesunate Tablets). It's been a tough time these last few hundred kilometres leading up to the border between Laos and China. The combination of pedaling all day up these moutains and the road at times disintegrating into a dirt track has been trying enough. But add the torrential rains that have lasted all day, every day, turning the road into a muddy bog, and morale has been strained to the max, even to the point of Melissa seriously considering throwing in the towel. At the time of writing however I am glad to report that she has steeled herself against rain, mud and gravity and pushed herself that magic 'extra mile' to the border here. It would have been a real shame if she had packed it in and taken the bus back to Vientianne. Plus, I'm convinced she would have regretted the decision some time from now, looking back with the benefit of hindsight when the more uncomfortable aspects of the trip will have faded with time, and she would have wondered 'what if I had just pushed myself that little bit extra....'. Now she will have the privilege of knowing. Crossing the border was a surreal affair. After a minor spat with the immigration officials on the Lao side (who decided to relieve their chronic boredom by yelling at two overheating and tired cyclists who parked their bikes in the WRONG muddy pothole outside the immigration shack), we bit our tongues and rode the 1km over no man's land to the Chinese side. Very different story! The fancy new road and bizarre avenue of brightly coloured business and residential buildings framed by immaculately manicured lawns and shrubs made for a very different impression to the shambolic Lao side. A kind of Disneyland meets the jungle. Which is the whole point of course. Showing off wealth and progress is very much a Chinese thing apparently. Go a few metres past the Agricultural bank at the bottom of town and the pavement segues abruptly back to muddy potholes, and the fancy architecture reverts back to decrepid old concrete block shacks that look like they've been there since the cultural revolution. The immigration officials took 15 mins to check alternative forms of my ID and whisked away my passport to the boss in the backroom to check the validity of the visa with Hong Kong (where it was issued). Hong Kong is the only place where it's possible to get a 6-month multiple entry visa with the minimum of fuss. I doubt they get many such visas presentated at this remote border post, hence the raised eyebrows. Anyway, bottom line is I got my entry stamp, good for 6-months, and Melissa has her 15-day 'visa on entry'. 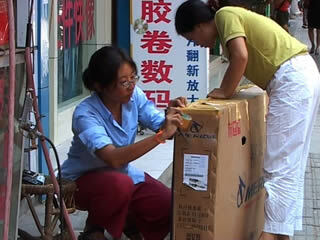 So she'll need to renew as soon as we reach Kunming in a week.